Frost in your garden, How to protect your plants. Posted: Mon Oct 20, 2008 12:39 am Post subject: Frost in your garden, How to protect your plants. It's been quite a few years since we experienced a frost that was severe enough to strike down everything from a single bedding plant right up to the longest run of mature hedging. Like many other gardeners, I myself have been lulled into a false sense of security and take the risk of planting certain borderline hardy plants outdoors, convincing myself that our upcoming winters will all continue to be "soft". But one day I may well be caught out, so I guess it is time I reassessed my relationship with frost before I lose a plant or twenty. How does frost damage our plants? Well, it damages them by turning the liquid within their cell walls to ice crystals; this expands and bursts the cell walls, leaving the plant in a sorry state. This will often kill tender plants, leaving hardier species scorched at the very least. How long the freezing period lasts has a big say on the damage done. Alternate freezing and thawing is extremely damaging as is allowing snow to remain for days on a plant. More scorching will take place during each cloudless and windless night that passes with snow remaining on the plant. Often confused with the effects of pests and diseases, it's worth your while noting what frost damage actually looks like. Well it generally appears as blackened or browned leaf tips and shoots, often wilting and curling due to the ruptured cells within the shoots. After a while these burned areas become hardened and brittle, their paper-thin form becoming easily crushed between your fingers. An example of Magnolia grandiflora, its leaves burned by frost, photo / picture / image. Flower buds and those flowers already fully open may become soft, squishy, and discoloured, usually brown. A prime example of this is the occasional frost damage exhibited by an early blooming Camellia or Magnolia. For those of you growing early flowering fruit trees and bushes, frost damaged flower buds rarely develop into fruit, resulting in a thinned out crop at harvest time relative to the frost experienced. Also, if you should happen to receive a late frost when your apples are small, it may cause brown corky roughened layers to form at the base of the fruit, not critical, but a bit unsightly. As a handy but non-scientific guide, 0Â° Celsius is a commonly called a touch of frost. At this temperature the damage to your plants should be slight, however, it depends upon the duration of the frost, relief of the growing area etc. At the very least you will see some of your evergreen plants exhibit a reddish-purple leaf discolouration due to freezing stress. At -2Â° C to 0Â° Celsius your garden will come under a light freeze, where your tender plants (certain Fuchsias, Griselinia hedging etc) may be burned with little effect on other hardier vegetation. Dropping as far as -4Â° C to -2Â° Celsius is regarded as a moderate freeze where many plants in your garden will be damaged especially fruit blossoms and tender plants. At a sustained -5 Â° Celsius and colder your garden will be in the grip of a pretty severe freeze (by Irish standards) and you can expect damage to all but the hardiest of your plants. 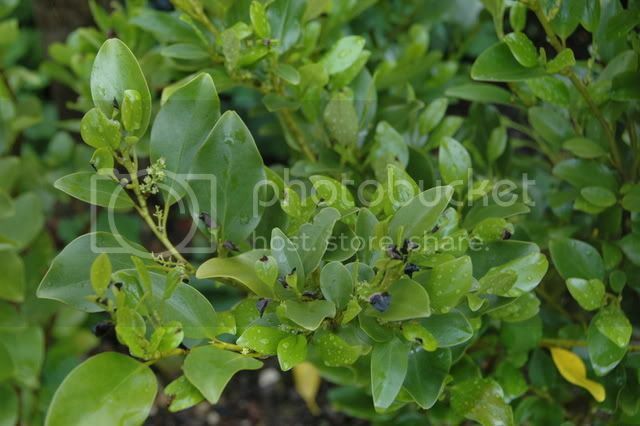 This example of Griselinia littoralis grown as a hedge has had its tips blackened by frost, photo / picture / image. A dry, calm and cloud-free night with stars twinkling in the sky sounds idyllic, doesn't it? However, that windless night with a lack of a cloud cover does a lot to frighten the average gardener. Without cloud cover to insulate the ground, and breezes to encourage air movement, we should all be on "frost alert". You can look to the sky and stars for these signs that flag up the likelihood of frost, or else you can keep an eye or ear or weather reports from the met office. Whatever method you use as a frost-warning signal, some timely preparation will go a long way to help protect your garden and the plants that live within. Exotic plants are just that, exotic, unusual, and great talking points. But beautiful as they may look, they may not survive one of our occasionally hard frosts, as this weather element is regarded as exotic in their native homes. Where possible, check the labels in the garden centre, do your research, ask local gardeners, and choose frost-hardy varieties for planting in your garden. When deciding where to position plants, take my advice and steer well clear of frost pockets. Frost pockets are usually identified as areas of ground lower than their surroundings, one example would be at the bottom of a slope with a constant damp and chilly feeling. Planting areas such as these, where lower temperatures hold reign and frost lingers far too long, are to be avoided for fear of freezing damage. Instead, tender species would be better served planted midway on slopes, where the cold air can't settle. Here they tend to suffer less frost damage as the cold air rarely lingers on its journey to the frost pocket at the bottom. Plants facing the south or the west bathe in the heat of the sun during the day and so are able to keep their temperatures slightly higher for longer on frosty nights. So especially where the more tender plants are concerned, south or the west facing is preferable to north or east facing. A soft sappy plant is a plant easily damaged by frost. Do not encourage this type of growth in your plants through overuse of fertilisers during the autumn and winter run up. Old growth is much more able to withstand frost, so avoid at all costs high nitrogen fertilisers, as these encourage that soft sappy growth which is easily frost bitten. On the flipside, many gardeners will feed their plants with sulphate of potash each autumn as they have found it toughens the stems against frost damage. When frost is on the way, you should have a few things to hand to offer protection to your plants. Basically, anything that prevents frosty air coming into contact with the plants leaves and stems is of benefit. Sheets of newspaper weighed down with stones, plastic bottles with their bases removed, and old pots are all suitable for covering smaller plants. For larger plants and trees, old sheets and light blankets, again weighed down with stones will offer frost coverage from top to bottom. Instead of weighing down, many gardeners instead clip the covers around their plants using clothes pegs. "A coat of many colours", this apple trees buds are protected from frost using sheets and pegs, photo / picture / image. Plants outdoors in containers can be particularly damaged by frost as their roots are above ground and unprotected. The simple step of wrapping the container itself in a blanket, sack, or bubble wrap will prevent containerised roots freezing. If it possible to move your containers, you should move them indoors or else locate them next to a south or west facing wall for the duration of frosts. This wall warmed by the sun during the day will act like a radiator overnight, keeping your container out of the frost zone. So, with these tips in mind, beware, keep watching the skies and stay on "frost alert". Any queries or comments on Frost in your garden, How to protect your plants, please post below. This was a timely article GPI after the most recent freezes. No right frost for years then you post this and we get hit. You psychic or what. Much appreciated. Just wondering, I've noticed my bulbs (daffodils, tulips) are starting to come up. Do they need protecting in this sleety weather? We havent quite had much snow,. more sleet and no frost. The green tips are about an inch high at the moment. thanks for any advice! thanks, they are in a flower bed and are mulched in so I hope they will be ok!